This site recommends books for places — fiction and non-fiction that explains or evokes a neighborhood, city, or country. To find books, look through the categories below or in the Index, use the search function, or just browse. By a bend in the Danube. Photo by angelscrime used under Creative Commons license. Tibor Fischer, Under the Frog (Picador, 2001). Those of us who were outsiders to closed societies like Hungary under communist rule are left to wonder: what was it like? Tibor Fischer— a Hungarian born and raised in London—is more than partly an outsider himself. His debut novel, Under the Frog, is a very dark and very funny comedy set in and around Budapest between the end of World War Two and the failed 1956 uprising against the Community Party. Fischer is writing here about his parents’ generation, and it is difficult to read this book and not catch both his pride in his parents and countrymen, as well diaspora-bitterness at plenty else. October 23rd, the first day of the uprising, is now a national holiday in Hungary. An overview of Fischer’s biography and his place in Eastern Europe’s diaspora writers can be found here. Larry Wolff wrote a review for The New York Times in 1994. A 1997 interview with Fischer about a later book, The Thought Gang, can be found here. A 2004 review of Under the Frog on the occasion of the 50th anniversary of the Hungarian uprising can be found here. Buy this book at Amazon.com. The decline and fall of a Sicilian aristocrat. Photo of Villa Romana del Casale by Neil Weightman used under a Creative Commons license. Giuseppe Di Lampedusa, The Leopard (Everyman’s Library, 1991). Here is a bio of Di Lampedusa. Random House offers this excerpt. Wendy Lesser wrote about The Leopard recently in Bookforum. Others writing about it include Nick Owchar (in the LA Times), David B. Kenner, William D. Reeves, dovegreyreader, Jules Roskams, Bhupinder Singh, Welshcakes Limoncello, and Tom. Photo of Warsaw by bartheq used under a Creative Commons license. Benjamin Weiser, A Secret Life (PublicAffairs, 2004). In August of 1972, a Polish colonel by the name of Ryszard Kuklinski contacted the U.S. embassy in Germany and arranged a secret meeting. Over the next several years, Kuklinski advanced within the Polish defense ministry, even as he continued to pass information to the West. In 1981, he relayed the government’s plans to crush the Solidarity movement, and then, fearful that he was in jeopardy, he and his family fled the country. Three years he was sentenced to death in absentia, but more recently he has been recognized as a Polish hero. The story of Kuklinski’s career as a spy is both a real-life espionage thriller and a glimpse of life behind the Iron Curtain. This seems to be a review by Thomas M. Troy, Jr., formerly of the CIA, but it’s hard to tell where it came from. Here’s a review from Peter Gessner of the University of Buffalo. And more from Walter Jajko and Richard Pipes in Commentary. After Kuklinski died in 2004, Anne Applebaum wrote about Kuklinski’s patriotism in Newsweek. Blogger t.s. posted a review. J speculates about whether the book is misinformation in the name of espionage, but still recommends it. A hard childhood in Concrete. Photo of Concrete, Washington, by Dean Forbes used under a Creative Commons license. Tobias Wolff, This Boy’s Life (Grove Press, 2000). A memoir of Wolff’s years as a troubled teenager in the 1950s and early 1960s. On the run from an abusive boyfriend, Wolff and his mother got off a bus in the Seattle area, and tried to make a new life in western Washington. Wolff found himself in difficulty of various kinds, most of all in his new stepfather, a cruel and abusive man. Wolff responded by re-inventing himself in different ways, such as by becoming a Boy Scout. While these were not the happiest of times he can be mordantly funny. Originally published in 1989. Google Book Search has an excerpt, among other things. (Note, though, that several of the reviews are of the movie instead.) Christopher Lehmann-Haupt reviewed the book for The New York Times. John A. Woodcock takes a somewhat medical perspective at NYU’s Literature, Arts, and Medicine Database. John Self posts at Palimpsest. Jen Teitle writes about meeting Tobias Wolff. This New York Times article is about Concrete and neighboring towns. Resting in a Danish bog. Photo of Tolland Man by emeuser used under a Creative Commons license. P.V. Glob, The Bog People (NYRB, 2004). One spring morning in 1950, two men cutting peat in a Danish bog uncovered a well-preserved body of a man with a noose around his neck. 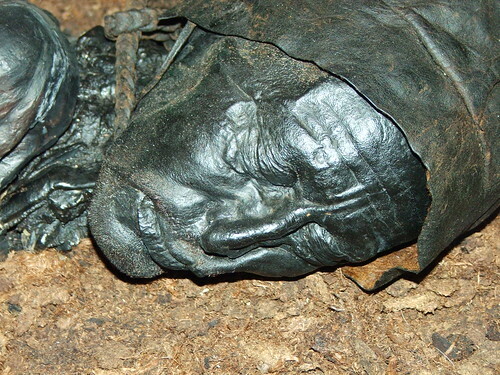 Police were baffled until an archaeologist identified the body as that of a two-thousand-year-old man, ritually murdered and thrown in the bog as a sacrifice to the goddess of fertility. There’s very little here about modern Denmark, but an awful lot about life in northern Europe during the Iron Age. Well received when it was originally published, and now reissued by NYRB. David Kraut reviewed the book at Bookslut. In 1991, Sarah Boxer wrote about the book’s influence on Seamus Heaney and other writers. Heaney has been rereading the book, and it has influenced other artists. William Clark offers a sort of introduction to the bog people. Two articles describes recent academic work on bog people. Via Chas. S. Clifton, Astrid catches recent archeological developments. There are more sheep than people in Wyoming. Photo by themaxsons used under a Creative Commons license. Gretel Ehrlich, The Solace of Open Spaces (Penguin, 1986). In 1976, after a personal tragedy, Ehrlich moved from the East Coast to a small ranch in Wyoming, where she found herself again. 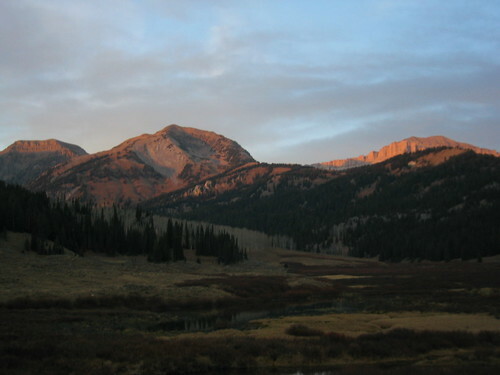 Ehrlich writes about Wyoming’s landscape and weather, about her neighbors and her new work as a ranch hand. A powerful, spare book which finds nourishment in desolation. For a long while, this was one of my favorite books. Here is a short bio of Ehrlich, an excerpt in the Norton Book of Nature Writing, edited by Robert Finch, and another excerpt in The Place Within: Portraits of the American Landscape by Twenty Contemporary Writers, edited by Jodi Daynard. Here are reviews by Judith Moore (The New York Times) and Paul Krza (National Review) and posts by Moe and The Blogging Forester. And you can listen to a recent piece on NPR by Ehrlich about training a colt. 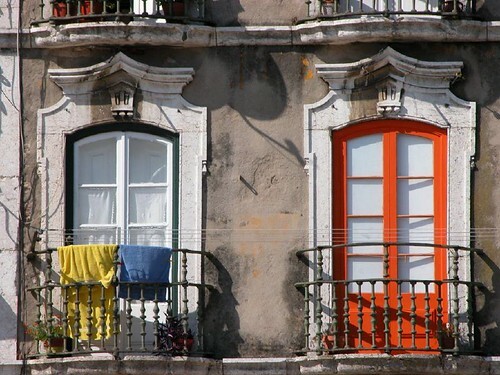 Photo of Lisbon Windows by david ian used under a Creative Commons license. Robert Wilson, The Company of Strangers (Harvest, 2002). Andrea Aspinall, a English mathematician and spy, meets Karl Voss, a double agent in the German Legation to Portugal, one of the few neutral countries in Europe throughout World War II. When they meet, the Allied landings in Normandy and Hitler’s atomic weapons programs are the backdrop. Their affair may be brief, but its effects last long into the Cold War, and after the collapse of the Berlin Wall. Wilson, an Englishman, lives in Lisbon. More of a spy novel that some of his earlier works. Reviews from Mostly Fiction, Curled Up, Marilyn Stasio (The New York Times) (scroll down), J. Kingston Pierce at January (scroll down) and his blog, Marius Silke (iVenus), and Erica Hanson.